When No Retreat, No Surrender came out, many didn’t take notice of anyone in the film except one: the Russian bad guy, played with charisma, if not with good acting, by a young man from Brussels who went by the long name of Jean Claude Van Damme. Hollywood decided to take a chance on him in a little martial arts film that would reveal a secret tournament that would be a secret to the world no longer: The Kumite. The rest would be history, but it starts with the tale of Frank Dux, the first westerner to ever win the Kumite, an illegal fight tournament held for 3 days in which the one rule is you can kill your opponent in combat. The film has an awesome opening showcasing the different fighters that would compete in that years’ Kumite, showing off their own martial arts styles. Soon we center on Frank Dux, a special forces agent for the USA who goes without permission to fight, which evidently is something the United States military frown on, so they send two bumbling agents, one played by Forest Whitaker. They need to get a life. We are then treated to a flashback featured really sucky child actors (the one playing Frank Dux is just damn odd. Like alien odd or something.) trying to break into the home of Frank’s future Shidoshi Tanaka (master) and steal his family sword. Of course Tanaka finds out and catches Frank as Frank is trying to return the sword to its mantle after his buddies drop it. So, instead of calling the police (which won’t really do anything) he decides to train Frank (see, now he can make some money charging him for lessons) Frank finds that he’s nothing more than a training dummy for Tanaka’s son, whose childhood dream was to fight in the Kumite. Now if his dream were to actually win the damn thing, he might have survived, but it wasn’t, and he didn’t. Frank then decides to go for Tanaka, but has to learn much more than he knows. This starts a great training sequence where Tanaka uses throws to make Frank sweep those mats clean with his back. I can attest as I paused in several spots and saw the mats didn’t have a speck of dirt on them. The sequence is actually good at showing off his form, which is some sort of Karate. I still cringe at the scene where Tanaka spreads Frank’s legs with ropes to force him into the splits…damn! Fast forward to Hong Kong a day or so later and we are introduced to Ray Jackson, a fighter from America played by Donald Gibb, a burly uncouth street fighter also there for the Kumite. We also meet a nosy reporter who did nothing but get on my nerves the entire film, mainly because she serves no real purpose except to have a love interest in the film. The crux of the film really rests on the friendship between Dux and Jackson, and Gibb and JCVD have a good chemistry onscreen to make the friendship believable, and not forced. After that Frank saves the reporter from another fighter, and scores a date with her. Afterward we get to the nitty gritty, the first day of the Kumite, and the fight scenes are actually very well done for an 80’s film. They showcase the main fighters going toe to toe with various opponents, and is a small montage of fights, but it whets the appetite for what’s to come. We then are back with the two agents who are out to get Dux and bring him back, in scene after scene that takes me out of the film anytime they are on. Who knew that the black guy in this film would eventually be such a great actor? They finally catch up to Frank, which leads to a horrid scene of Frank running around Hong Kong gracefully, while they chase him around a hell of a lot less gracefully. Just a bad moment for weak slapstick comedy. To further bring the film down we go back to the reporter Janice and her date with Frank, which ends in a one night stand where we get to see Van Damme nearly naked, a hallmark of his films from now on. Hell, I guess it beats seeing Steven Seagal’s Buddha belly. We then get back for day 2 of the Kumite, and the fights live up to their promise here, and I have to say I think this is nearly the best Van Damme has ever looked martial arts wise, which supports a theory I’ve always carried about JCVD: he’s only as good as his fight choreographer is. Some films, like this one, he shows great skills, and in others he shows poor skills or the same two damn kicks. You can tell he really wants to emulate the Hong Kong stars, but he just doesn’t have the skillset. Enough of my musings, back to the film. During this sequence we also get the most brutal Chong Li fight, where he defeats his fighter and then breaks the poor bastards leg at the shin. It made me cringe when I was a kid, and it still does so now. Good fighting by all involved. Look for a funny scene between Dux and a tall African fighter. Dux’ s last fight of the day features him fighting a really big guy whom he takes down by doing the splits and punching him in the nuts really hard. Note to all fighters: do not wear either a kilt or a loincloth as it calls unwanted attention to your nether region, and your oppenent will surely strike you there. Every. Damn. Time. The final fight of the day belongs to Jackson versus Chong Li. Surprisingly, at least to Chong Li as much as us, Jackson comes out and starts stomping him down. In what would be a final act of stupidity that doesn’t result from brain damage, Jackson starts celebrating before Chong Li is even down for the count, Even Chong Li blesses his lucky stars right before he delivers a world class beatdown to Jackson, culminating in a viscious kick to Jackson’s head, and Van Damme has what may be one of the worse acting moments of his career here yelling “Stooooop!”. Fast forward to Jackson in the hospital after having surgery while the surgeons put his brain back together that was shattered like puzzle pieces, and Janice gets on Frank’s case for fighting in what must be the dumbest non-argument in the film to drum up drama that wasn’t needed. We are then treated to another 80’s staple, the slow ballad that tells the audience exactly what Frank is thinking as he rides a subway, even seeing a ghost image of Chong Li reflected in a window. The next day Frank gets his pre fight workout using the Hong Kong police force those two dunce agents use to attempt a capture, and finally they decide this isn’t worth it, so they may as well go enjoy the final day of the kumite, which features another Van Damme staple, lots and lots of slow motion in his fight scenes. Chong Li actually kills his opponent after the guy is already beaten, and the judges turn their back on him in a great “That’s not cool, bro” moment. We then come the final battle between Chong Li and Frank Dux. Of all the fights in the film, this is the one that disappointed me the most. No complexity to the fights, and far too much slow motion. 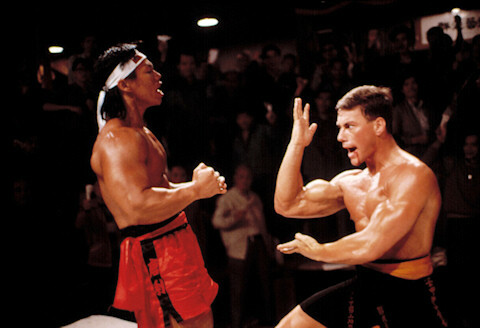 I know Bolo (his real name is Yeung Sze) has good fighting skills, but I can’t say the same for Van Damme. This end is indicative of the his future films: lots of slow motion, no one knows how to block, and every major fight ends with the patented JCVD helicopter kick, which he uses several times to dispatch Chong Li. The film soon ends after we find out the Jackson won’t be a drooling mess for the rest of his life, and we are treated to stats of Frank Dux’ s actual accomplishments in the kumite. Pretty cool stuff. CHOREOGRAPHY: (7) The fight scenes are well done here, until you get near the end, where the imagination basically gives way to showing JCVD giving beautiful kicks in slow motion. STUNTS: (8) The fighters all bring their “A” game to this, and perform well, showcasing a myriad of fighting styles. DIRECTION: (7) Newt does a good job shooting the fights without a lot of heavy editing. The acting could have been better, but was okay for what it was. Once again, what the hell was the deal with the sucky kid actors? STAR POWER: (7) JCVD does a good job for his first starring role, displaying the charisma and good looks we would come to know. Forrest Whitaker doesn’t get to do much, but hell, he’s there. Bolo does a good job as always. FINAL GRADE: (7) A good film that showcases the Kumite and no doubt become the template for tournament martial arts films and video games for years to come. Many would come and go, but Bloodsport remains the first and best of them. ANYTHING beats seeing Segal’s Bhudda belly! Great review. I am not sure if this film is my cup of tea. The very idea of the Kumite churns my stomach. I think this film may have too much testosterone and not enough whimsy for my taste, but that’s just me. What fascinates me the most about it is that the main story is true. With the advent of UFC I wonder if the real Kumite still exists anymore, or has it changed to meet the times?